If I could hand you a key to productivity, a key that would magically give you some nights and weekends back, what would you expect it to look like? I’m guessing that you wouldn’t picture a workflow. 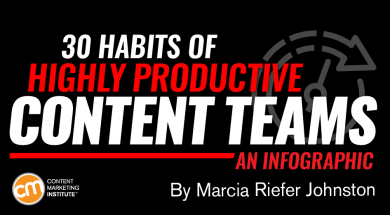 Yet your workflow may be robbing you of nights and weekends, according to Heather Hurst, director of corporate marketing at Workfront, and Matt Heinz, president and founder of Heinz Marketing, who presented this topic during a ContentTECH session this year. As content teams move through these stages, information often moves from spreadsheet to email to a Word document and back again. Inefficiencies abound, and team members find themselves feeling frustrated, overworked, underappreciated, and unproductive. Encourage everyone in the organization – including those who don’t create content – to submit ideas. That last one is my favorite. Are your potential customers getting dumb advice? That’s a content idea crying out to you. Create a process for people to request content (or to share a content idea). For example, you might use a dedicated email address, web form, or work-management tool. Document your process, make sure everyone understands it, and require everyone to follow it. Designate one person to manage the process of requested content. This, in itself, may turn an inefficient and complex process into an easy one. “The process owner doesn’t necessarily have to do a lot of work,” Matt says. The owner sorts and organizes ideas as they come in, simplifying the editorial team’s review task. “This is typically one page that helps the team – copywriters, designers, client stakeholders, and anyone else involved – understand what the high-level goals are for each (piece of content). Provide a template for a content brief that works for all types of content. Fine-tune the template to include everything your team needs but no more. “You have to balance keeping the creative brief simple with getting enough information to make good business decisions,” Heather says. For an example of what a creative brief looks like, see Katie’s article, A Content Strategy Starter Kit for Marketers. Ask requesters to connect each content idea to a business goal. (Joe Pulizzi suggests that you look at these four goals for content marketing.) Will the content drive revenue? If not, how will that content be useful? What effect could it have, and how can that effect be measured? For example, you might expect a good blog post to get people to read your blog more often. Maybe one piece of content generates leads or enables the sales team to more efficiently communicate a point to make people more likely to buy. Ask requesters questions like these: How should this content be targeted? In what context would this content have an impact? How does it fit with existing content? How does it support our strategy? Ask what you need to ask to get the big picture. Figure out early how each piece of content will be distributed. “Don’t make assumptions about how that content is going to get into the field,” Matt says. Make sure whoever is responsible for distributing each piece – maybe the sales team or some other customer-facing team – knows why they’re doing it. “It just goes out into the ether,” Heather adds. Before you set out to develop any piece of content, think through the costs and resources associated with distributing it successfully. Make sure your distribution strategy fits your budget and your people. Will you need social media images? Blog posts? Infographics? Landing pages? Videos? Identify all the formats and types of content you need to succeed. Establish a system for prioritizing, especially when you’ve got a small team and limited resources. Examine your priority list regularly. Don’t do a project just because it happens to be in front of you or because someone has screamed for it. Consider the impact each piece of content might have and the degree to which timing could affect that impact. Before you create a piece of content, envision opportunities to reuse it. For example, you might create a set of independent pieces (say blog posts) that you later feed into a big piece (like a book) for its own distribution. Or you might go the other direction and create a big piece (say a research report) and later break it into parts (like infographics) to use separately. Identify the parts of the business that you support. Choose your focus. Decide who your internal customers are and who they’re not. Let everyone know how you’re allocating your time. “That clarity adds a whole lot of efficiency to the process,” Matt says. Consider setting up rules for how to handle ad-hoc requests (aka fire drills). Some Agile content teams, for example, allow only one ad-hoc request to be in process at any time. “You may not always have the luxury of saying, ‘Sorry. We’re already working on one. We can’t take another one,’” Heather says. Still, you need a process. Decide how many ad-hoc requests your team will take at a time and how you’ll reprioritize when needed. Then let everyone know what you’ve decided. You’ll reduce the number of ad-hoc requests, keeping your strategy on track and helping your content teams avoid burnout. When I was working in a PR agency doing projects for Microsoft, there was a set amount of time allowed for the Microsoft reviews, including legal review and everyone else. If you needed the reviews completed in two days or in one day, you paid for rushing things. There was literally a cost that came out of your marketing budget. Keep your requesters informed. After people submit a content request to you, don’t let that request disappear into a black hole (from the requester’s point of view) where, eventually, a miracle occurs and a piece of content pops out. Establish a process for communicating with your requesters. Let them know when you have rejected their ideas, when you have accepted their ideas, and when you need more information. Communicate the production timeline. Consider creating templates for your standard communication through all stages of content development and production. The more you communicate your priorities and the outcomes you’re working toward, the easier saying no becomes. If you don’t have enough resources to fulfill every content request, saying no does, in many cases, help people see where your boundaries are. When you say no, you often make it easier for management to understand that you need more resources. How do you know when to say no? Understand how long it takes to create a piece of content. Document the steps for creating and producing content. Look at the data to figure out how long each step typically takes, not just to do the work but to wait for reviews, wait for approvals, and wait for a publication spot to open up. Templates help authors create content efficiently and consistently. Make a template for each type of content you create: press release, e-book, brochure, and so on. If you lay out the structure of each type, the amount of time it takes, and the stages you go through to create it, your team sees what they’re signing up for. I have a to-do list that I look at every morning. When I travel, I carry a laminated version. It reminds me of a number of content creation and curation tasks I need to do every day. Reminders can keep your work consistent, save you time, and help you get more done. You spend less time thinking about the things you need to remember and more time executing, more time being creative, more time being productive. Decide who needs to review and approve your content for each stage of your process. When expectations aren’t clear, these points in the workflow often become bottlenecks. Figure out which stakeholders need to be involved, when, and with what content. If you send drafts to people who don’t need to see them, you waste their time and yours. Determine which stakeholders must review – legal, your CMO, the author on a ghostwritten bylined article – and which ones you hope will review but don’t need to wait for. Establishing a review process doesn’t mean people will follow it. People are busy. They procrastinate. They review half-heartedly and then, at the last minute, call you and ask to have another look. With each reviewer, make clear what you expect and when you expect it. State the consequences to the project if you don’t get what you’re asking for. Ask each reviewer to commit to delivering what’s needed on time. Have a system in place for accountability when commitments are not kept. “We often forget the importance of ongoing communication,” Heather says. “It’s key to keep all your content moving.” Requesters need to know where a piece of content stands in the process. Stakeholders need to know what’s coming up this week and next. Everyone needs to know who’s going on vacation during the production period. Your workflow is never final. Capture feedback at every stage so you can learn where your processes are on track and where they could improve. Review feedback and make improvements at least monthly. Doing so reduces friction in your teams and enables them to get more done faster. “How many times have you seen something marked ‘Final Version 32’ or ‘Final Version 68’?” Heather asks. To keep content moving forward smoothly, reach consensus on the criteria for when a piece of content is done – and then keep that content off the table. Store your content files in a place that’s accessible to everybody who needs them. Your content teams need to know more than where content files live. They may need answers to questions like these: Is this file still OK to use, or has it expired? Does an updated version exist? What type of asset is this? What audience does it appeal to? Who requested it? When was it published and where? Don’t rely on tribal knowledge about your stored content. Establish a protocol for capturing the information your teams may need about each file. Establish file-naming conventions. Consider not only the elements you want each name to contain but the order you want those elements appear in. When files are named in a consistent way, you can sort on whatever comes first in the name. For example, you might start each file name with a project name or client name or you might start with year-month-date. Whatever your content teams are most likely to want to sort on, put that at the beginning. Then, when people sort those files by name, they can quickly find the files that start with that first thing – the project name, client name, date, etc. – because those files will appear together in the list. Think through your naming convention as thoroughly as you can before disseminating it. After you have a server full of files, it’s impractical to go back and rename them. Coming up with the naming convention is the easy part; the proof is in the doing. Make sure that everyone involved knows and follows the convention. Matt and Heather quote CMI’s chief strategy adviser Robert Rose as saying, “Just because something is done doesn’t mean it’s time to publish it.” Don’t let the order in which content is completed determine the order in which you publish it. Do your publication and promotion scheduling strategically. Whoever promotes your content – your sales team, your demand-gen team, your blog team, your social media team – keep those people in the loop so they can have resources and plans ready when the content is ready. Communicate the purpose, audience, and intended use of upcoming content and whatever else the promotion team needs to know to prepare effective emails, ads, and other assets. Come up with content-promoting practices that work for your organization. You may want to use certain hashtags in your social media posts. You may want to give new life to your best old blog posts. You may want to elevate your brand by building relationships with influencers in your industry. Whatever promotion practices work well, document them, and do them regularly. Getting salespeople to use your content is not always easy. The content may be just fine, but people may not know where to find it or they don’t know how a given piece of content would help them make money. While sales teams often see direct value in product content they may not understand how content that establishes a need or a commitment to change could impact sales. Help sales reps understand how non-product-related content contributes to customer loyalty and, ultimately, profitability. Make sure that your reps know how to find the content they would find most relevant. Seek the early adopters, and promote their successes to other salespeople. Check in frequently, based on whatever relevant measurements you can get, to find out which content is performing best and how often your content is achieving the business goals you had set for it. Explore ways to determine which topics people find most interesting, which content your sales team used a lot, and which content drove an unexpected level of demand. Keep reviewing results. Adjust your plans accordingly. The better you and everyone you work with understand your content workflow, the more productive your content teams can be. How about your workflow? Have you documented and communicated all aspects of it for everyone who needs to know? Have you gained back some nights and weekends? Share your own high-productivity habits in a comment. Catch Matt Heinz presenting at Content Marketing World this September. Register today for early-bird rates and use BLOG100 to save an additional $100. Editor’s note: Thanks to all our ContentTECH sponsors: Act-On, Highspot, ion interactive, Marketo, ON24, SnapApp, Uberflip, Vidyard, and Workfront. You can access all sessions for free until May 22, 2017.